He says the US must choose between investing in African Americans and welcoming immigrants. Do Democrats have an answer to that false choice? Two weeks ago, Donald Trump was busy bashing a Latino judge. This week, following the massacre of 49 mostly young, queer Latinos at an Orlando nightclub, his contribution to the national tragedy was to expand on his call for a blanket ban on Muslims entering the country. In between those two assaults on his favorite imagined enemies—Mexicans and Muslims—Donald Trump took out a bit of time to let it be known that he likes black people. Or at the very least, that he sees them as expedient political allies. Last week Trump, temporarily neutered, was convinced to read from a teleprompter for two public addresses. At the Faith and Freedom Coalition conference on June 10, the presumptive Republican presidential nominee swapped out his usual bluster in favor of stock political phrases and numbered bullet points. But he also made a far more intriguing general election pivot. He took up the concerns of African-American voters, pitting them against those of immigrants and refugees. Trump, laying in to Hillary Clinton, invoked black Americans first in code: “She’ll be trapping kids in failing schools. She’ll plunge our inner cities into even deeper poverty, if that’s possible.” He then mentioned them explicitly: “Her education policies, her economic policies, her immigration policies, and her trade policies will plunge our poor African-American, Hispanic communities into turmoil and even worse despair,” Trump said. There are a few ways to consider Trump’s newfound interest in the plight of black Americans. This being electoral politics, and the subject of interest being Donald Trump, one can discount racial justice or even magnanimity as among his motivations. What’s left, then? Trump had just come off a disastrous week, even for him, after he repeatedly criticized US District Judge Gonzalo Curiel, who is overseeing a case involving Trump University’s allegedly fraudulent real-estate seminars. And he made matters worse when, at a rally in which he was deflecting charges of racism, he pointed to a black man in the crowd and bragged about “my African American.” Other elected Republicans, who prefer to speak in racial codes and dog whistles, stepped back in horror from the new face of their party. House Speaker Paul Ryan called a press conference where, flanked by House leaders and black community activists, he denounced Trump’s remarks about Curiel, while unveiling an anti-poverty plan (which itself could be called a “textbook” example of racist public policy). 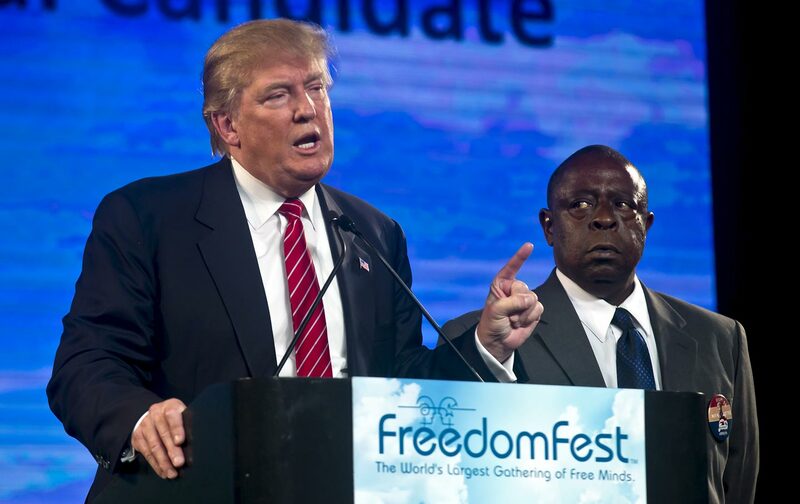 But the fact is, Trump does have his own platform aimed at African Americans, and since the earliest days of his presidential campaign he has deployed one black supporter repeatedly: Jamiel Shaw Sr.
Trump has a storied history with a uniquely anti-black strain of racism. Shaw is the father of Jamiel Shaw Jr., a 17-year-old football star who was killed in 2008 in Los Angeles by Pedro Espinoza, a 19-year-old undocumented gang member who, as the popular story went, mistook the unaffiliated Shaw for a rival gang member and shot him to death. (The actual case may have been more complex.) Anti-immigration advocates seized on the story in 2008 to bolster their anti-immigration arguments, and Trump has revived the story for a 2016 audience. Losing his son galvanized Shaw, who voiced support for Trump early, and met with the candidate in person last July. In February of this year, with the South Carolina primaries around the corner, the Trump campaign released an ad starring Shaw and his son’s story. “I believe Donald Trump loves America and he wants to make America great again,” Shaw Sr. said in the ad. On April 28 at a Trump rally in Costa Mesa, an hour south of Los Angeles, Shaw and members from the Remembrance Project, a group that gathers stories of people whose family members allegedly have been killed by undocumented immigrants, joined Trump on stage. One among them spoke out loudly, and it was Shaw. “You don’t want to know what it feels like,” Shaw went on. “You have the opportunity to do something, what we call preventative maintenance. Is it bringing in Donald Trump? He’s going to fix everything. He’s going to make America great again.” The crowd went wild for Shaw. His raw energy, his unequivocal endorsement, and his pure belief in the simplicity of the political calculus are stirring. Trump, it should be noted, has a storied history with a uniquely anti-black strain of racism. In 1989, Trump reportedly paid $85,000 for full-page ads in New York City’s major newspapers, including the Daily News and The New York Times, to share his thoughts on the Central Park Five case. Trump bought the ads just weeks after Trisha Meili was found in the park brutally beaten and raped, and after five teens—four African Americans and one Latino—had been arrested, their names and photos published widely. In the ad, Trump decried “roving bands of wild criminals [who] roam our neighborhoods,” and waxed nostalgic about the good old days, when cops used to lift rude customers out of their seats at cafes and toss them in the street. He saved his strongest words for all-caps: “bring back the death penalty and bring back our police!” The five teens were ultimately wrongly convicted, their confessions procured through coercion. Death threats to the family of Yusef Salaam, one of the Central Park Five, increased after the ads ran, Salaam told The Guardian this year. Trump’s anti-black racism also reared its head during his extended birther obsession—though that also overlaps with a xenophobic paranoia. So if Shaw and Trump’s recent rhetorical pivot are overtures to black voters, Trump surely hopes they have a short memory. Nonetheless, it is worth taking seriously his efforts at black outreach, if not for electoral reasons then certainly for a broader challenge to the strain of politics Trump has elevated into mainstream discourse. In Trump’s limited political imagination, economic investment in black Americans and humanitarian inclusion of refugees are either/or proposals and our national capacity for caring is zero-sum. Tellingly, in Trump’s rendering, the concerns of black Americans never overlap with the concerns of immigrant communities; they are always only at odds with each other. In his vision, the greatest threat to African Americans, after Hillary Clinton, are immigrants. This is not a new tack. Anti-immigration advocates have been attempting to recruit African Americans to their cause for decades—or, more precisely, anti-immigration advocates have long couched anti-immigrant sentiment in rhetoric that suggests concern for the welfare for African Americans. They’ve also propped up black voices to criticize immigrants and immigration in an effort to suggest, if not actually develop a broader base of support. In 2013, as immigration reform was heating up in the Senate, the anti-immigrant umbrella organization Federation for American Immigration Reform (FAIR) set up various front groups to add some color, as it were, to its anti-immigration reform advocacy. One of them, People for the American Way reported, was named the Black American Leadership Alliance (BALA). BALA was itself a revival of Choose Black America (CBA), a supposedly black-led group FAIR formed in 2006 when immigration reform efforts were also picking up steam in Congress. Latinos and African Americans have been in more regular conflict over such political spoils as municipal jobs, additional council seats, and other perks and benefits associated with holding influential political office (Alozie and Ramirez 1999; Cose and Murr 2006; McClain 1993; Vaca 2004). Latino-African American political coalitions in major cities appear to be more fragile than they were just a few years ago (Kaufmann 2004). Younger generations appear less willing to see themselves as part of a rainbow than older generations who remember the original efforts by minority leaders to form a unified front against white control of public office. A decade later Trump is probably not staying up late reading old CIS briefs, but he’s been adept at co-opting these strategies nonetheless. And he’s found an ardent supporter who’s willing to do the dirty work for him. Shaw’s blackness gives him cover from accusations of anti-immigrant racism that follow Trump and his white supporters, and his awful grief laid bare chastises would-be critics into silence. How can anyone turn away from a father who will spend the rest of his life grieving the loss of his baby boy? The response from pro-immigration forces has never been able to meet the emotional urgency of Shaw’s arguments. Such is the power of tokenism. Such is the power of a tragic and violent story disconnected from context about immigration and crime. Such is the power of the simplistic policy solution Donald Trump has proposed: the roundup and mass deportation of the 11 million undocumented immigrants in the United States. Researchers with the American Immigration Council have found no link between immigration status and crime rates. Between 2010 and 2014, 121 people were released from immigration custody and went on to be convicted of murder, CNN reported. Those 121 people amount to one-thousandth of 1 percent of the total number of estimated undocumented immigrants currently in the country, according to CNN. And yet, the emotional impact of Shaw’s appeal wallops any statistic, leaving Trump and his policy prescriptions to float powerfully above any larger sense of reality. I called up Tia Oso, a national organizer with the Black Alliance for Just Immigration, a national group which works at the intersections of racial justice and migrant rights, to ask her how she’d been digesting the Shaw show in recent months. BAJI’s chapters in Oakland, New York City, Atlanta, and Los Angeles are centered in immigrant hubs to meet the needs of growing black immigrant populations from Latin America and Nigeria, Ghana, Ethiopia, and other African countries. In other words, BAJI represents black Americans and immigrants—even if never the twain shall meet for Trump. Oso yawned at first when I asked her about Trump’s political approach. “Undocumented immigrants or previously deported folks have been used by the GOP and anti-immigrant policy wonks for a long, long time,” Oso said, unimpressed by Trump’s lack of political creativity. “By using plain language, a little humor, and a lot of preying on people’s fears to gain his support,” Trump has been able to spread a message that, were it to come from the mouth of an actual elected official, would immediately disqualify them or be read as disingenuous political rhetoric, she said. The rub, Oso said, is that, “the same Republican candidate who is now aligning himself with people who say, ‘We want to protect black communities,’ this is the same Republican who, if Jamiel Shaw had been killed by a police officer, would have called him a thug. Who, if he had been killed by another African American in that unfortunate situation, would have said, ‘Look at that black-on-black crime.’” If you would have even asked Trump about the plight of African-American teens a year ago, you’d have gotten a blank stare, Oso promises. “If he couldn’t use Shaw, Trump would have no interest in him at all,” Oso said. Pro-immigration advocates have more than just Trump’s political expediency to worry about; he’s only exploiting fissures that those on the left haven’t properly addressed for themselves. Oso said the left is hampered by a reticence in the mainstream immigrant-rights movement to address anti-black racism within communities of color. For example, national and border security provisions in immigration reform bills don’t affect all immigrants equally—immigration-control programs that depend upon local law enforcement empower the racism, intended and unconscious, of local police agencies and thus make black and Latino immigrants uniquely vulnerable. The sociologist Tanya Golash-Boza has found that Afro-Caribbean and Central American undocumented immigrants are far more likely than Asian immigrants to be deported, for example. A 2014 report from the Mexican American Legal Defense and Education Fund found that undocumented immigrants from Latin American countries (including those with large black populations) constituted nearly 97 percent of all 2013 deportations. “There’s a reluctance to address the role of race in immigration policy,” Oso said. But shuffling around the issue without grappling with race is holding back the the immigrant-rights movement, she argued. Work needs to be done, and with Trump moving in to this vulnerable political space, those in the mainstream immigrant-rights movement have been scrambling to wrap their heads around this dynamic this year, Oso said. We’ll no doubt see more of Shaw, and more from Trump leaning on this particular pressure point. It’s not hard to imagine him repeating his recent challenge to Clinton directly in a debate, pushing her to choose in his narrow paradigm between the welfare of African Americans and humanitarian relief for Syrian refugees abroad. The more pressing question is, will Hillary Clinton, and those on the left and in immigrant communities, have a better response?